An effective search strategy helps you find the specific information you need. In Step 1, you defined your information need by analysing your topic, identifying keywords and brainstorming alternative keywords. Now you need to create your search strategy. A search strategy is a plan for how you will combine your keywords to create an effective search, usually in an Advanced Search. An Advanced Search helps you refine your search to find highly relevant information, whereas a Basic Search may find more results, but they may not be relevant. In an Advanced Search, you combine your keywords with search boosters to either widen (find more) or narrow (find fewer) the search results. These boosters include Boolean operators, truncation, wildcards, phrase searching, and nesting. Place a Boolean operator (AND, OR, NOT) between your keywords to include or exclude keywords in a search. The yellow shaded area of the image shows the refined results. AND will find results where both words appear, and gives the fewest results. OR will find results where either word appears, and gives the most results. NOT will exclude a word from a search, giving a refined search. The word after "NOT" will be the word excluded from the search. These boosters both widen your search results, and use punctuation characters (asterisk and question mark) from your keyboard. You can search for a phrase, rather than individual words, to narrow your search results. Use quotation marks around the phrase, placing the words in the correct order. e.g. 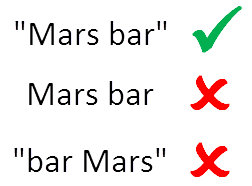 "Mars bar" rather than Mars bar or "bar mars"
Use this booster carefully, as it can omit results that could have been useful. Most databases provide a Help Tool or Search Tips. Brackets to combine various search boosters within a single search, usually for highly specific searches. 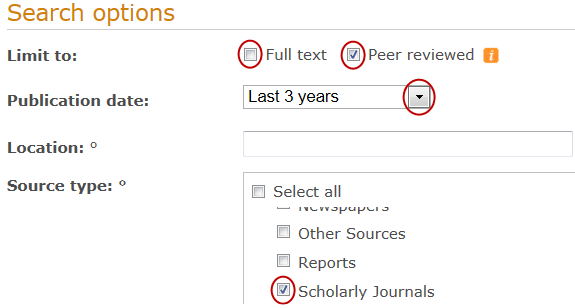 Search the Abstract field for your keywords, and select peer reviewed or scholarly articles as required.